First Avenue mall and hotel ... a rendering. Fit-out for the retail units is set to take another four months, and the mall is expected to open in May, along with the adjoining hotel. “We are delighted that First Avenue mall is on schedule for a soft opening in May,” says Dr Ramy Moussly, ATDI general manager. First Avenue’s anchor tenants are in place, taking up 40 per cent of the mall’s leasable area. Leading retail chain Carrefour will take up 11 per cent; Prime Medical Centre 9 per cent; Fun Block, part of Fun City by Landmark Group, 9 per cent; Reem Al Bawadi, a famous Arabic food and beverage chain, 6 per cent; and ACE Hardware will have the remaining 5 per cent. Furthermore, First Avenue will have 70 high-street retailers and 15 casual dining restaurants. The adjoining four-star 150-room hotel, which can be accessed directly from the mall, will be operated by Park Inn by Radisson, with an all-day restaurant, lobby, meetings and events spaces, gym, spa and swimming pool. 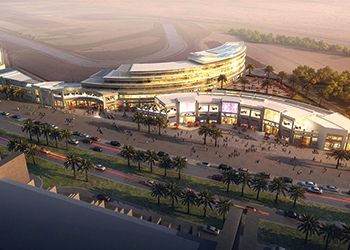 The mall will be an all-week-round social and retail hub with a distinct automotive and lifestyle theme. The two-storey development stretches across 500,000 sq ft and will have an underground car park with 400 spaces. Motor City is a rapidly growing area in Dubai, close to Studio City, Sports City and Arabian Ranches, and a short drive from Al Maktoum International Airport and the Expo 2020 site.